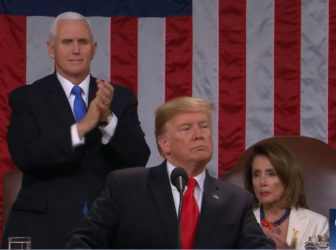 Vice President Mike Pence stands and applauds President Trump during the State of the Union speech Tuesday. Speaker of the House Nancy Pelosi remained seated. Washington – President Donald Trump hammered familiar themes – including the need to curb immigration and boost infrastructure – and unveiled several new initiatives during his State of the Union address Tuesday night, but Democrats panned the speech even before he uttered the first word. Trump delivered his second State of the Union speech Tuesday night to a divided Congress and a divided nation. As he did during last year’s State of the Union address, Trump made a pitch for bipartisan unity. But for many Democrats, some of what Trump said rang hollow while other parts of the speech were clearly fighting words, including his repeated demand for border wall funding that has already resulted in a 35-day partial government shutdown. The president gave his speech as the investigation by special counsel Robert Mueller inches towards its conclusion after the indictment of six Trump associates, including longtime ally Roger Stone. Trump slammed “ridiculous, partisan investigations” Tuesday night, and warned that they would derail American progress. Connecticut Sen. Richard Blumenthal said he believed “a lot of jaws dropped” when Trump attacked the investigations. 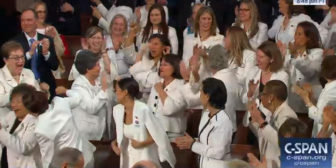 Democratic House members, including Connecticut’s Jahana Hayes, wore white to recognize the suffragist movement. Trump spoke to the nation just 10 days before the potential start of another partial government shutdown, the result of a failure of congressional Democrats and the White House to come to an agreement on the budget. In this context, his calls for unity were not dismissed by Rep. John Larson, D-1st District. Trump spent a considerable part of his speech warning of the dangers of illegal immigration and once again pressed for money for his border wall, something Democrats say is a non-starter. “I will get it built,” the president vowed. He said he has ordered another 3,750 troops to the border with Mexico. Trump also announced a second nuclear summit with North Korean leader Kim Jong-un in Vietnam on Feb. 27-28. DeLauro also said Trump’s speech was “rife with hypocrisy” because the president spoke of his support for protections for those with pre-existing health conditions while he simultaneously supports efforts to eliminate those protections, provided by the Affordable Care Act. “The speech was short on a vision of our country and was divisive under the cover of bipartisanship,” she said. Congressional Republicans, however, were enthusiastic about Trump’s speech. House Speaker Nancy Pelosi, D-Calif., who sat behind the president as he gave his address, did not say anything. But she managed to send a message anyway by inviting two active-duty transgender Army officers — a rebuke of Trump’s decision to ban transgender service members — and the father of a victim of last February’s mass shooting at a Florida high school in protest of GOP opposition to stricter gun control. 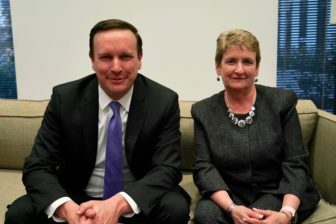 Sen. Chris Murphy and Regina Moller. Connecticut lawmakers also invited guests to send messages and promote their priorities. Murphy’s guest was Regina Moller, executive director of Noank Community Support Services, which cares for immigrant children, including two who were separated from their families at the U.S.-Mexico border last week. Besides sheltering separated children, Moller’s center has also provided housing and help to hundreds of unaccompanied immigrant minors. 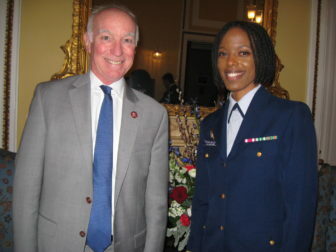 Rep. Joe Courtney, D-2nd District, hosted Lt. Commander Kimberly Young-McLear, an instructor at the U.S. Coast Guard Academy. According to the Department of Homeland Security’s inspector general, Young-McLear, who is black, suffered retaliation after she made complaints about being the target of workplace bullying for years. Rep. Jim Himes, D-4th District, invited Lane Murdock, a Ridgefield high school student who organized a student walkout after the massacre at Marjory Stoneman Douglass High school in Florida last Valentine’s Day. Dozens of Democratic women, including DeLauro and Rep. Jahana Hayes, D-5th District, wore white to honor the women’s suffrage movement. Stacey Abrams, who lost the Georgia governor’s race amid charges of voting irregularities, gave the Democratic rebuttal.